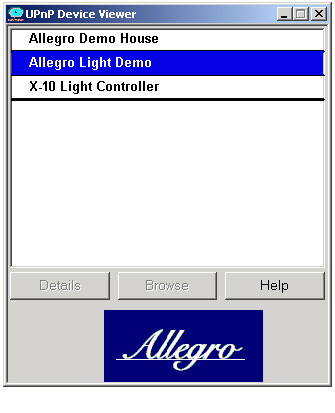 BOXBOROUGH, MA, (February 28, 2001), Allegro Software Development Corporation announces it is shipping the UPnP Device Viewer program with every RomUPNP toolkit. The Device viewer program displays all Universal Plug and Play (UPnP) enabled devices on the local network. Universal Plug and Play (UPnP) is a set of open standards technologies for transparently connecting appliances, PCs, and services by extending the Plug and Play concept to support networks and peer-to-peer discovery, configuration and control. The UPnP Forum is committed to device interoperability in a number of areas and has established working groups for Home Automation and Security, Internet Gateways, Imaging and Printing, Audio/Video, Mobile Devices and Appliances. The Windows XP operating system supports the UPnP protocols and provide an easy way to detect, describe, and connect to UPnP devices. Earlier versions of the Windows operating systems have limited or no support for UPnP. The Allegro UPnP Device Viewer program works with any Microsoft Windows operating system. The UPnP Device Viewer program discovers all UPnP enabled devices by requesting them to send out their ID and the Viewer displays the name of the device in a window. When the device shuts down it send out the shutdown information and the name disappears from the Viewer window. Clicking or highlighting the device name them clicking on the Details button presents complete information about the device including its unique UPnP identification number, name, serial number, version, and other details. It also shows the URL of the device. Double clicking the device name in the Viewer window brings up the default Web browser and connects to the opening HTML page of the device. The UPnP Device Viewer is great for home entertainment centers that utilize UPnP enabled devices. One can easily see which devices are powered up and running. In the office is can be used to see which printers, scanners, and other UPnP enabled devices are available. 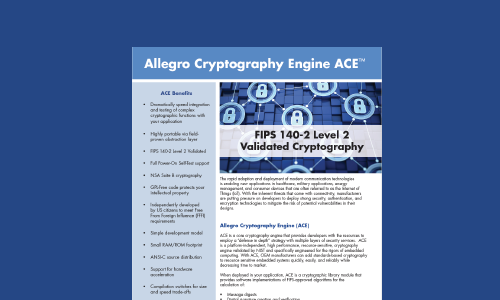 Allegro Software is a leading OEM supplier of Internet software for the embedded market. With over 1,000,000 deployed embedded Web servers, Allegro has some of the world’s best companies as its customers; companies like American Power Conversion, Casio, Cisco, Hewlett-Packard, McDATA, Motorola, Sony, 3Com and Xerox. Allegro’s industry-leading software includes Web servers, Web clients, Email (SMTP and POP3) clients, an XML parser/framer and Universal Plug and Play (UPnP) toolkits. This material is © Copyright 1996-2002 by Allegro Software Development Corporation. RomPager® is a trademark registered in the U.S. Patent and Trademark Office to Allegro Software Development Corporation. RomCLI, RomDNS, RomMailer, RomPOP, RomTime, RomUPNP, RomWebClient, and RomXML are trademarks of Allegro Software Development Corporation.